Pest description and crop damage Shothole borers are pests of forest trees, ornamental shade trees, and shrubs as well as fruit trees. Apple, pear, cherry, and plum are all attacked. 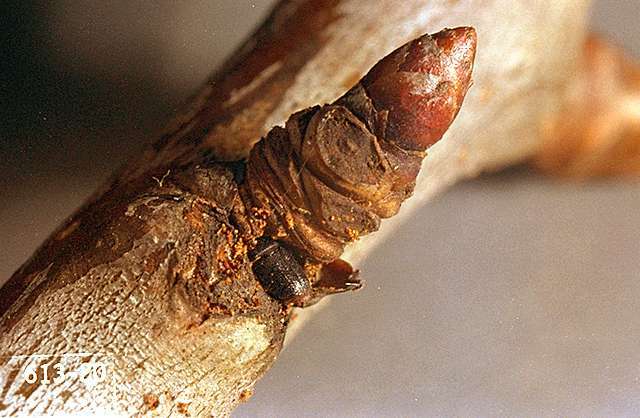 Borers are primarily a problem on injured or stressed plants, but healthy trees growing adjacent to blocks of neglected trees also may be attacked. The adult shothole borer is a brownish-black beetle about 0.12 inch long. 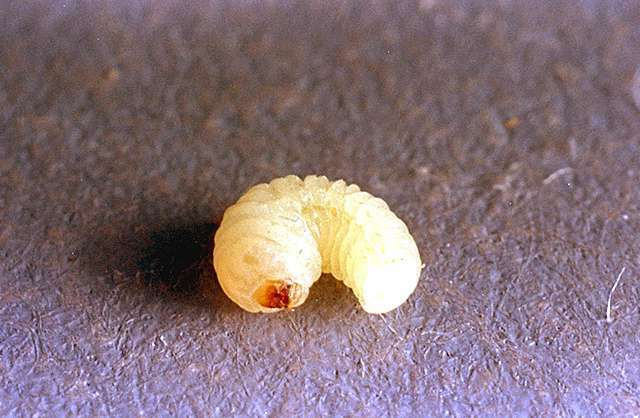 The larvae are white, legless, and about 0.17 inch long. A similar wood-boring beetle, the ambrosia beetle, is about 0.12 inch long, dark brown or black, and covered with yellowish hairs. The larva is pinkish-white, legless, cylindrical, and 0.2 inch long when mature. Larvae and adults of both these species bore into the cambial and vascular tissues of trees, weakening them and causing wilting and dieback of individual stems and branches. Trunks and branches can be completely riddled with galleries. Biology and life history Shothole borer overwinters as a larva in burrows beneath the bark of infested trees. They pupate under the bark and adults emerge in spring or early summer, mate, and fly to susceptible trees to feed at the base of leaves or small twigs. Borers then tunnel into the tree, excavating galleries parallel to the wood grain laying eggs along the gallery. The eggs hatch and the larvae feed by tunneling at right angles to the main burrow, causing a characteristic pattern of damage. The burrows are filled with frass (excrement) and increase in diameter as the larvae mature. After 6 to 8 weeks, the larvae pupate at the ends of the galleries and emerge as adults starting in August. The many small, round exit holes this creates gives a "shothole" effect. There are two generations per year. Ambrosia beetle overwinters as a mature larva, pupa, or adult in galleries in the tree. When spring temperatures exceed 65°F, the females become active, fly to susceptible hosts, and bore into the tree. Eggs are laid in the gallery, and, as they develop, the female carefully tends them and cultivates ambrosia fungus for them to eat. 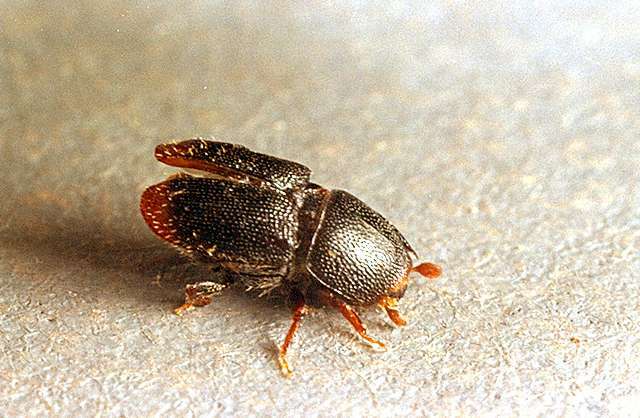 The females usually remove excrement or wood dust from the tunnels and this, along with the uniform width of the galleries, distinguishes them from other wood-boring beetles. Young adults can be found tightly packed in the galleries in midsummer, where they remain until the following spring. There is only one generation per year. Pest monitoring Examine branches in late spring for holes 0.12 inch in diameter, oozing sap and sawdust. In stone fruits, these holes often are sealed with gummy ooze. Beetles are particularly attracted to unhealthy trees. Destroy or remove all prunings, particularly infested prunings, and keep trees in healthy, vigorous growing condition. Borer attack usually indicates trees are unhealthy. Whitewash trunks of young trees to prevent sunburn and reduce potential hazard of attack by shothole borer and flathead borers. Pesticides must be timed to manage adults and are often not very effective. Cultural techniques are typically the best management practices. Direct trunk and limb sprays to infested and neighboring trees when adults are active (late February to early March, June to July, September to October).